Lilith. Pandora. Circe. Salome. “La Belle Dame sans Merci.” Carmen. Brigid O’Shaughnessy: the eternal “femme fatale” still fascinates us. 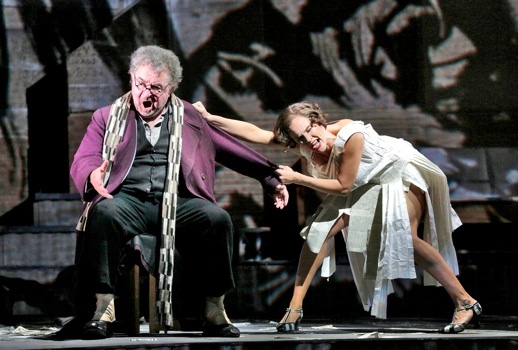 To bring to new life to one of the most challenging of the species, the Metropolitan Opera turned again to director-artist William Kentridge for a gripping, doom-laden production of Berg’s Lulu that opened Thursday night, featuring an astonishing Marlis Petersen. Based on a pair of plays by Frank Wedekind about an amoral woman and the circle of admirers she bewitches and written during the late 1920s and early 1930s, Lulu had a tortured birth as Berg died in 1935 before finishing his second opera. Though the incomplete work premiered in 1937, it was not until Berg’s widow died that Friedrich Cerha’s realization of the incomplete third act could be performed, first in Paris in 1979. James Levine and John Dexter finally brought Lulu to the Met in 1977, with the three-act version performed there since 1980. As he had in 2010, this fall Levine withdrew from Lulu at the Met, this time with Lothar Koenigs jumping in. Although not as lush as Levine’s, Koenigs’s reading emphasized the often rapturously lyrical side of Berg’s spiky tone rows. He drew admirably supportive playing from the Met orchestra, subtly building the momentum—particularly during the difficult third act—to a shattering climax. Eschewing showy effects and never covering his singers, Koenigs went for a clarity that revealed the myriad intricacies of Berg’s score. Were many missing the ailing Music Director by the evening’s end? Given the critical and popular success of The Nose in 2010, it was inevitable that the Met would invite that production’s mastermind to return. 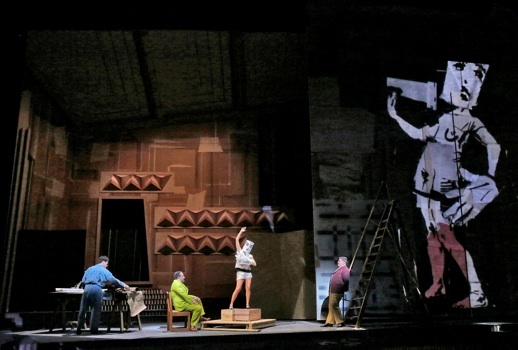 Anyone who saw the Shostakovich will immediately recognize Lulu as a Kentridge project: his dizzyingly inventive animated projections again dominate the action—Berg’s world viewed through a nightmarish Expressionist kaleidoscope. Kentridge’s team of Luc de Wit, Catherine Meyburgh, Sabine Theunissen, Great Goiris and Urs Schönemann, all Nose veterans, returned to assist in bringing to life his eye-filling, ever-busy vision. The Art Deco sets only incidentally form the backdrop to the tale of Lulu’s rise and fall. Instead the eye is constantly drawn to an ever-changing parade of images, many of black ink on newsprint, presumably to invoke Dr. Schön’s tabloid newspaper. A common motif shows ink being applied to the right-hand page of a book. Then the left-hand page is folded over and then pulled back to reveal a bifurcated image—a Rorschach test. So Kentridge asks us to interpret what we “see” in Lulu—is she the devil who destroys? Or are those in her orbit authors of their own fate? His admirably clear production leaves open that quandary. Those who rail against intrusive directorial intervention will have little cause for complaint here: there is scarcely a moment that a careful reader of the libretto would not recognize. And Berg’s score explicitly notates each character’s entrance and exit, and Kentridge conscientiously respects those. Yet the production is no slavish recreation; the Personenregie is extremely lively and detailed and his admirable cast responds with complex, fully realized portrayals. His most prominent, least effective innovation may be the addition of two silent characters played by Joanna Dudley as a Lulu-double in a Louise Brooks bob, who mostly crawled on and about the onstage piano and Andrea Fabi as a tuxedoed servant who appeared fortuitously on occasion to hand out important props. She in particular added little to the action, occasionally seeming a distraction. And, yet, as with his previous productions, I wondered if his unending bombardment of images always serves the work. Occasionally in Lulu, as in Kentridge’s Il Ritorno d’Ulisse in Patria, Die Zauberflöte, and The Nose, the visual bravura eventually becomes wearying. 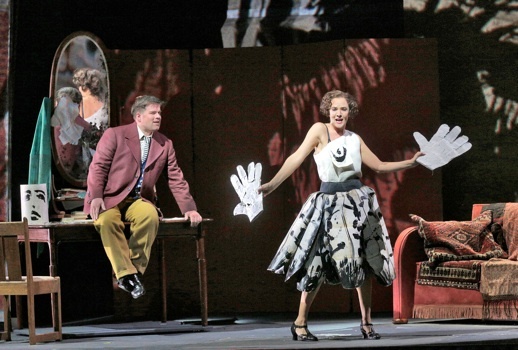 Rare are moments of stillness, but then it’s true that Berg’s characters never get off the careening carousel that is “Life with Lulu.” But so much goes on in a Kentridge production that one is nearly obliged to return to take it all in. But will repeat viewings necessarily reveal more? I wonder. 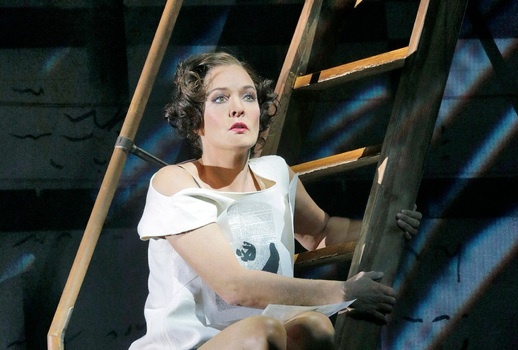 Petersen has said that these will be her final performances of Lulu after having sung the role for nearly 20 years: this alone makes attendance at one of the remaining seven performances essential. Although one could hear that the high Ds now tax her mightily, she retains a remarkable vocal stamina and security. Her ecstatic “O Freiheit!” when released from jail was absolutely radiant. The heartbreaking final lines begging Jack the Ripper to proceed with their assignation were delivered with a fresh, young voice that belied the nearly three hours of intensely demanding singing that had preceded it. Nearly always in motion and regularly displaying a knockout pair of legs, Petersen bravely embraced Kentridge’s intensely physical characterization. Her Lulu was so insouciantly self-confident that Alwa was fated to rapturously proclaim her unchanging allure. Yet as mercilessly self-absorbed as her Lulu is, Petersen never lost a vulnerability which made the third act unusually touching. 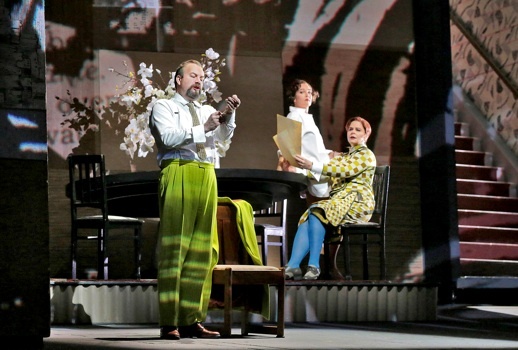 Anyone who caught the stream from Munich earlier this year of Dmitri Tcherniakov’s chilly production of this opera must admire how remarkably different this equally superb portrayal was. The November 21 HD transmission will no doubt be an unmissable event featuring an important Lulu bowing out still at the top of her game. Susan Graham might seem unlikely casting for Geschwitz, but she embraced the pining, awkward Countess. Although the middle of her voice was sometimes lost in ensembles, her still-strong top soared in the wrenching lament that closes the opera. In his Met debut, young American Daniel Brenna as Alwa disclosed a healthy, baritonal tenor that occasionally failed to soar in some of his more expansive music. Whether he’s ready for the “big time” will become clearer when he takes on Siegfried at the Washington National Opera this spring. Johan Reuter’s stalwart baritone struck me as occasionally underpowered for the Met as Barak two years ago but his powerfully tortured Dr. Schön seemed a better fit, while his baleful Jack the Ripper was chilling. At 78, Franz Grundheber returned to the Met for the first time in over a decade for a more forthright, less sickly Schigolch than one sometimes sees, and his now-ravaged baritone still shows traces of its former vigor. Paul Groves struggled with the high tessitura of the Painter and the African Prince although he was aptly frightening as the latter. Another tenor, Alan Oke, provided amusing vignettes as the Prince and the Manservant but sounded parched and unthreatening as the Marquis, while Martin Winkler opened the evening strongly as the Animal Trainer and then delighted as the slimy Acrobat. Elizabeth DeShong shone in her three roles and was particularly delightful as the roly-poly, besotted Schoolboy. At nearly 80 years old, Lulu apparently remains for many a formidably demanding evening of music theater: the four people directly in front of me left after the first act and there were many defections after the second. The 12-tone style may disappoint those yearning for melody, yet there are many moments of aching beauty. And, for better or worse, there’s never a dull moment in this dazzling new production highlighting the mercurial and devastating Petersen.